Ida B. 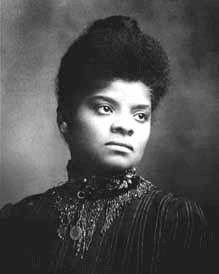 Wells Barnett (1862-1931) – Born in Holly Springs, Mississippi, Ida Wells would become African-American educator, newspaperwoman, anti-lynching campaigner, and founder of the NAACP. When both her parents died of yellow fever when she was just 16 years old, she dropped out of high school and found employment as a school teacher. In 1880, she moved to Memphis and became a part-owner of the Memphis Free Speech newspaper, launching her activist career. Though a mob ransacked her offices and threatened her life if she did not leave town, she stood steady. In 1895 she moved to Chicago, where she married a widower and African-American rights advocate named Ferdinand Barnett. The couple published the Chicago Conservator, where Ida wrote many articles on the lynchings taking place in the south, as well as beginning to lecture widely. She was a founding member of the National Afro-American Council, served as its secretary, and was chairman of its Anti-Lynching Bureau. Wells was also a founder of the National Association for the Advancement of Colored People. Wells-Barnett continued her tireless crusade for equal rights for African-Americans until her death in 1931.